Books I would like to read but will have to wait for another day ! Between my constant impulsive buying of books and the steady stream that arrives from publishers for review, (especially at this time of the year when a disproportionate number of titles seem to be published), I am feeling slightly overwhelmed by the plies of books on my desk right now so here are some notes on books that are going to be taken to the beach cottage this coming weekend for reading over the summer. How could I not buy this even though it may be several years before I am in London again? I simply could not leave it in the shop! And of course although I can see it will be an excellent guidebook when I do get back to London, in fact it will also be fine to read it as an armchair explorer. Complete with maps (I have trouble resisting books with maps included) this guide not only takes you to the homes of Keats, Oliver Goldsmith, Pepys, T.E. Lawrence and hundreds of other authors, it also introduces the fictional world of Bertie Wooster, Sherlock Holmes and others as well as listing all the bookshops along the way. This is much heavier going but clearly is a major work of scholarship by two academics specializing in religious studies about one of the most significant contemporary New Zealanders. This reader is the first collection of the writings of Lloyd Geering, covering a period of over 45 years. Over the past decade Lloyd Geering has become an international figure, sought out by readers and audiences in North America, Great Britain and Australia. New Zealanders have, of course, been aware of him and his writings for a much longer period. Yet this reader includes material that will also be new to many of his New Zealand readers, and demonstrates the remarkable consistency and development in the thought of this increasingly influential thinker. This reader is important because it provides another form of autobiography – the development of New Zealand’s premier public intellectual and a fascinating coverage of the engagement of religion and the modern world – both nationally and internationally. I’m really sorry to have to put this one aside for now because I have the highest regard for Peace’s writing. He was one of Granta’s Best of Young British Novelists in 2003, he won the James Tait Black Memorial Prize in 2004 for GB84. 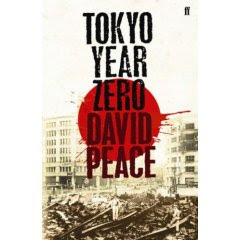 This new novel is the first of a planned Tokyo trilogy. Set in August 1946 one year on from surrender a quick skim of the book suggest Peace has blended fact and fiction together in a skilful manner. This is going to be a great holiday read I can tell. Interestingly the author lives in Tokyo with his wife and family. And Ian Rankin recommended this title to Roger Hall when they were talking about other crime writers. New Zealand cinematographers are rated among the best in the world and in his extensive introduction the author touches on the reasons for this. He then outlines the work and achievements of 12 of our most successful cinematographers with about 30 pages on each including colour and black & white photographs from their movies. A big read, a regrence book really, it looks interesting but no time right now!